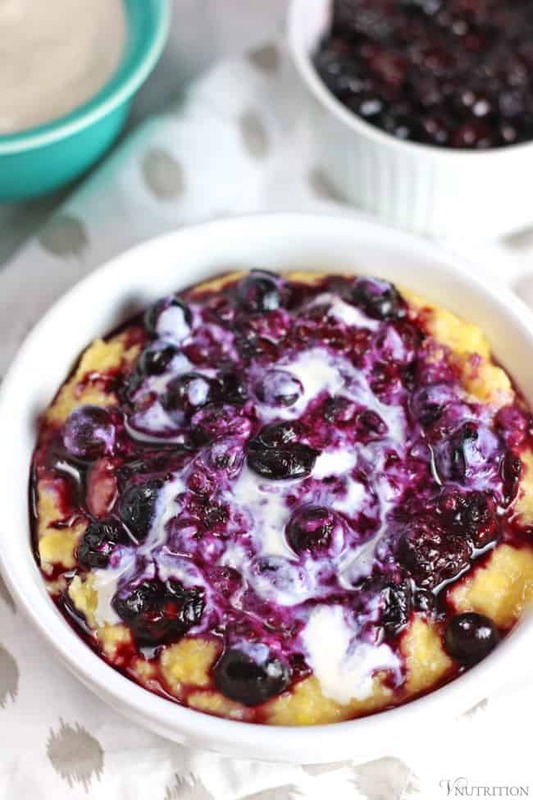 This creamy dairy-free Breakfast Polenta is a tasty alternative to oatmeal to start the day. 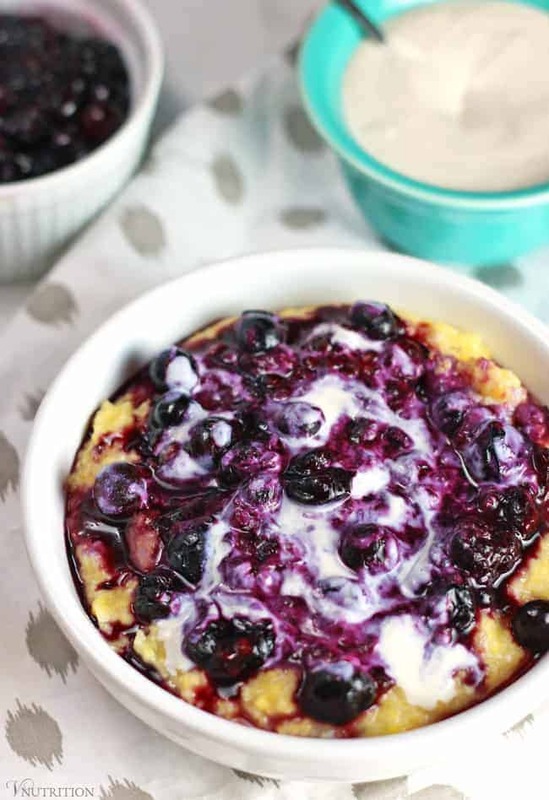 Topped with berries and cashew cream, it’s an easy to make, gluten-free, and delicious breakfast! Do you ever get in a breakfast rut? Make the same thing every day? I get into doing the same thing as well. 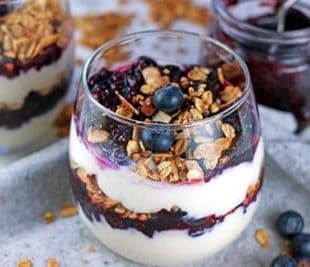 Most of the time I’m running out the door with a smoothie or a jar of Peanut Butter and Chocolate Overnight Oats during the week and having a Simple Tofu Scramble or Pumpkin Baked Oatmeal on the weekend. 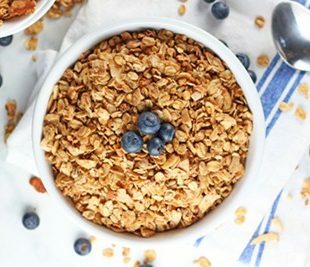 While all of these are amazingly delicious (definitely check them out), I am always on the hunt for new healthy breakfast options. That’s why I’m so glad I was asked to review the book Vegan Yack Attack on the Go! You probably know Jackie Sobon from her site Vegan Yak Attack, have seen her beautiful photography in other vegan cookbooks, or have checked our her sweet treats in her VegNews magazine column. 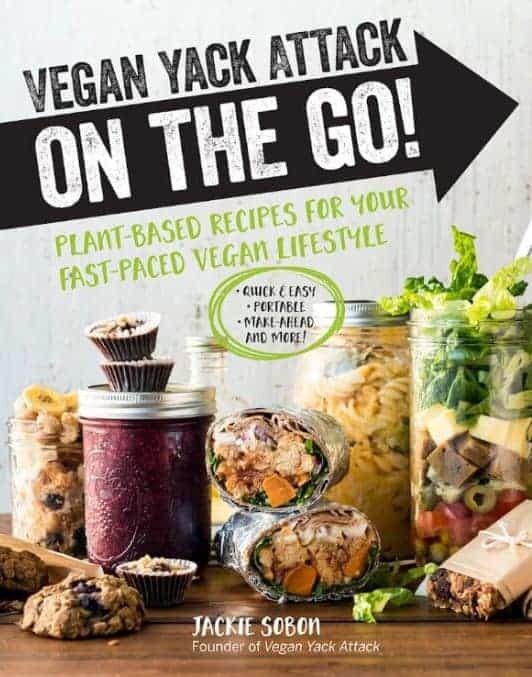 In her new book, Vegan Yack Attack on the Go, Jackie want to help those vegans who are always on the go and want to eat a healthy plant-based diet. She understands the need for options that can be made in advance, taken to go, or prepared quickly and easily once you get home. I feel like Jackie’s book is talking right to me! I always feel like I am running out the door, to a meeting, or jumping on a client call. With so many make ahead meals, Jackie makes healthy eating easy. Besides the Breakfast Polenta I’m sharing today, I also have my eye on a few other recipes like Cauliflower Curry Grill Packets, Baked Lentil Balls, Summer Stew, and Easy Vanilla Chip Buckwheat Bars to name only a few! Polenta sometimes gets confused with the words cornmeal or grits. Cornmeal (which I use in my Poporn Tofu – try it, you’ll love it) is made by grinding dried corn kernels. Polenta is an Italian type of porridge made from coarsely ground yellow cornmeal. Grits are a Southern US Staple made from white cornmeal (also called hominy). Since they are both made from dried corn, they usually can be swapped out for one another if needed. Since corn is one of highest GMO products in the US, I always opt for the organic kind like the Bob’s Red Mill brand. When looking at Jackie’s photos, I would not have thought this Breakfast Polenta would be so easy to make. It probably took me about 15 minutes total from start to finish. I started the polenta and berries at the same time on the stove, stirring both constantly. When they were done I threw in the cashew cream ingredients to a blender, zipped those up and added it all into a bowl – easy peasy! Note: Jackie’s directions call for the polenta to be cooked for 18-20 minutes but mine were done in like 5-8 mins. It could be that Jackie used real Italian polenta and I used the Bob’s Red Mill kind so be sure to check the ingredients on the package to be sure you know how long to cook them for. I had leftovers so I was able to enjoy these the next day as well. I stored the polenta, berries, and cashew cream separately. To reheat, I added the polenta to a pot with a little extra water then topped with reheated berries and the cashew cream. 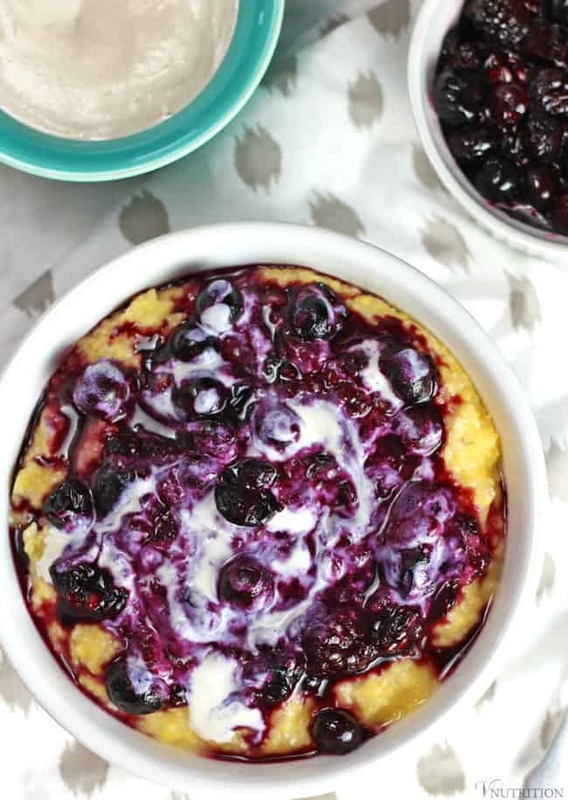 I hope you love this Berry Breakfast Polenta recipe as much as I do. If you try it, please come back and leave me a comment below with your feedback and rating. Share your pictures of any of my recipes on Instagram and tag @v.nutrition so I won’t miss it! 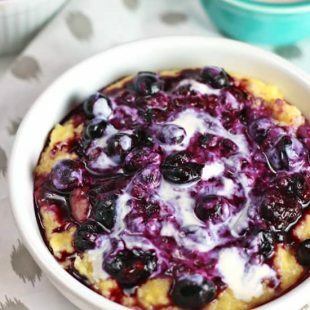 This creamy dairy-free Breakfast Polenta is a tasty alternative to oatmeal to start the day. 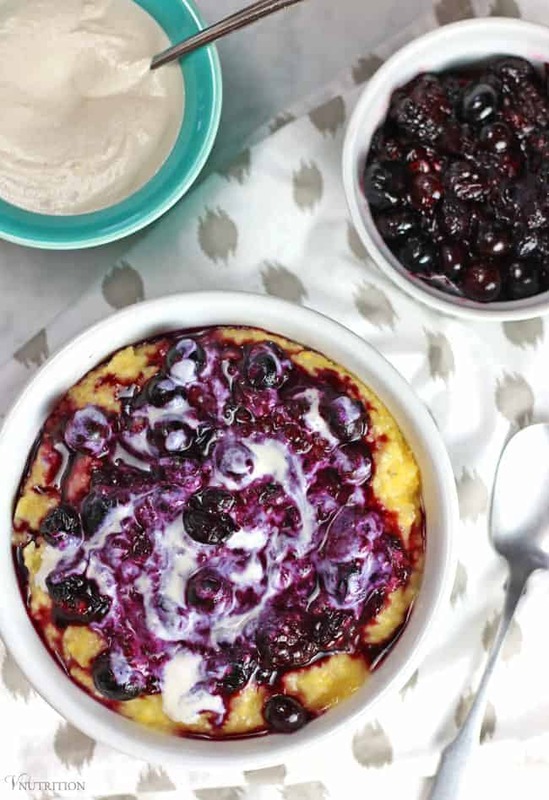 Topped with berries and cashew cream, it's an easy to make, gluten-free, and delicious breakfast! Posted with permission from Jackie Sobon's Vegan Yack Attack On The Go! © 2018 Quarto Publishing Group USA Inc. In a large pot over medium-high heat, bring the nondairy milk and water to a boil. Stir in the maple syrup, and add salt to taste. Keep warm until ready to serve. While the polenta is cooking, warm the blueberries, blackberries, and water in a small saucepan over medium heat. * Bring to a simmer, adjust the heat to medium-low, and cook until the berries start to break down, about 10 minutes. Lightly mash the berries if they are not breaking apart. Divide the creamy polenta between 4 bowls, and top each with some berry mixture. Dollop 1 tablespoon of Simple Cashew Cream on top of each bowl (if using), and serve warm. * If you do not have fresh berries on hand, frozen will also work. You may have to cook them longer because they retain more water. * Jackie's directions call for the polenta to be cooked for 18-20 minutes but mine were done in like 5-8 mins. See post for more details. * Make sure to soak the raw cashews in hot water for 10 mins before blending. This recipe will make much more than what is called for in the recipe but you can use the leftovers to make anything else creamy too! * Nutrition info does not include cashew cream. The Raffle is open to US residents only. It’s a great book! Great recipes and wonderful pictures! This looks so delicious. 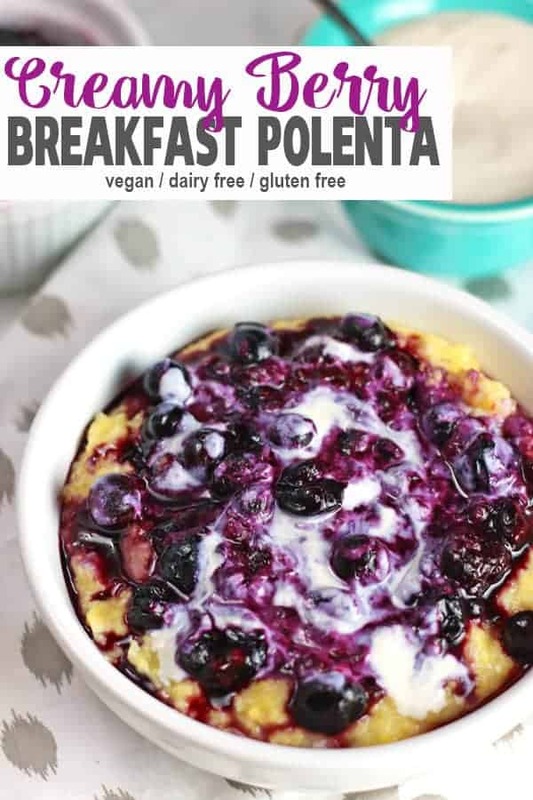 I’ve only ever used Polenta for savory dishes, I”m going to have to try this. Can I sub frozen blueberries for the fresh? I usually opt for a piece or two of vegan toast with almond butter and either sliced banana or a scattering of fresh blueberries on top. Quick and easy for me since i am not a morning person! This looks great! I usually always eat avocado toast, but my absolute favorite weekend breakfast is the chilaquiles from one of the thug kitchen cookbooks. If we’re really doing it up, it’s served with hash browns, fresh refried beans and a warm flour tortilla with plenty of hot sauce. Yummy! !